It is hard not to lose sight of the big picture this time of year. The big picture is that there is great fishing to be had both inshore and off but the focus is inevitably drawn to thoughts of dolphin, big dolphin. June is when the bulk of the larger dolphin are caught in the Keys. This is not to say that there are not outstanding catches in both size and number the rest of the year; however, this is when the bulk of the fish are expected to move through. Actually, there is not a day of the year that you cannot catch dolphin in the Keys, but you get the drift. It is no accident that the bulk of the dolphin tournaments occur in June. While most everyone I know loves to have a cooler full of tasty dolphin for the dinner table, most would like that cooler to be full with a few slammer-sized fish as opposed to dozens of school-sized ones. To accomplish this task, there are a few things that you can do to make this goal a reality. While occasionally you will find fish that refuse to eat, most often the fish that you find will be in the mood for a snack. Find the food and there will most likely be someone around to take advantage of it. Birds, bait, and boards are a great starting point in any search for fish. Use your eyes and elevation to help you find structure like floating dunnage discarded by the shipping industry. An invaluable tool for helping you spot flotsam is a quality pair of polarized sunglasses. Do not skimp on your eyeware. The ability to cut down on glare is an invaluable tool. Logs, buckets, barrels, discarded netting or Houser line, and just about any other thing that floats can hold the attention of fish. When you make your first pass on any structure, look carefully for both the amount of growth on the structure and the amount of baitfish around the structure. Overtly clean structure might not have been in the water long enough to have attracted much attention. Structure with a large school and/or a variety of baitfish will have the highest likelihood of holding fish. Of course, finding birds working an area means that there is feeding activity going on, and you need to pay particular attention to what is going on under them. Floating structure is another place where paying special attention to your down rigger will pay great dividends. If you do not hook up on your first pass by a likely floating thingy, send your down rigger bait down deeper. I usually keep my ball on about 45 feet of line. Sending the ball down another 45 will often draw a strike from sulking fish. If you get no strike, send it down another 45. If there is no activity, you can leave the spot knowing that you did a thorough search. If you do not have a down rigger, try dropping a vertical jig on the spot down a few hundred feet and working the jig back up. Even if you do not draw a strike, fish will often follow the jig back to the top where you can present a live bait. Most anglers know to keep an eye out for the frigate birds. However, the smaller terns are sometimes a more reliable indicator of fish in the area. Learning to read the behavior of the birds will save a lot of fuel and time. The big frigates are a little like myself – they too suffer from fishing ADD. They will break off of fish at the drop of a hat to squabble with other birds, or to look for another or better fish to follow. Larger fish will also sound from time to time and be available for an easy meal offered from a downrigger. But once that fish sounds the frigate will lose interest. The terns, on the other hand, will usually stay glued to a feeding or cruising fish. When there are both terns and frigate birds working an area, I will bet on the terns. With either bird, elevation is not your friend. The higher the bird is flying, the higher the likelihood that they have lost the fish and are looking for another dining opportunity. Reading the terns is a skill that you should hone. With time and a bit of trial and error, it becomes second nature. A good rule of thumb is, the bigger the flock of birds, the smaller the fish they are usually following. Big flocks that are fast-moving usually indicate some type of tuna, as opposed to dolphin. In the search for big dolphin, do not ignore the schools of small fish. The favorite meal of a slammer-sized dolphin is a school-sized fish. When working a school of schoolies, keep an eye on the periphery. Large fish are like wolves circling a herd of deer. They keep far enough away looking for signs of weakness without spooking the meal. Having a pitch rod ready with a larger bait like a pinfish, ready to toss at the first sign of a “biggun”, is a sure way to hook up on the trophy. When trolling a weed line, once you have a few small fish in the box, you can move off of the line a few hundred feet and have a better chance of finding a slammer patrolling the weed line from afar. We all see flying fish while trolling along offshore. Knowing which of these fish are being spooked into the air from our presence and which are being launched by an attack from below is another inexact science. Suffice it to say that the farther from your boat the flying fish are spotted leaving the water, the higher the likelihood that there is a game fish causing the launch. On a final note, there are a lot more boats offshore this time of year, and safety and courtesy need to be a priority. Learn the basic rules of the road. Remember to give a boat passing in front of you a couple of hundred yards leeway before crossing his wake, to assure that all of their baits have passed. When trolling along a weed line and passing a boat on the same side of the line, do not expect the other boat to cross the line to avoid a collision. Pass port to port on each side of the line. When working a piece of floating structure with other boats, it is possible to pull the school off of the structure and away from others working the structure. Inviting another boat to join you on a structure can actually help keep a bite going and help you stay on fish that would otherwise lose interest. And finally, listen to your radio. 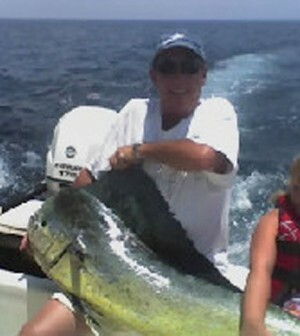 Because of the transient nature of offshore fishing, most captains are happy to offer information on the location of fish. You can pay that information back the next time you are on the fish.